It is getting to the time of the year when cookie exchanges are being planned. They are a fun way to share your new holiday cookie recipes. 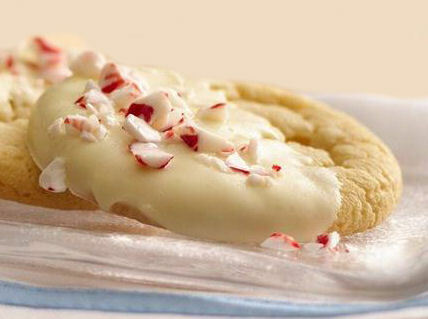 This peppermint crunch sugar cookie from Pillsbury will be a great one to add to your line up of Christmas cookies. I love making cookies this time of the year for cookie swaps. Another great Christmas cookie recipe is the one for lemon snowball cookies. They bring out the holiday spirit just like these peppermint crunch sugar cookies do. The recipe is easy. Just three ingredients and you are have a masterpiece! These cookies are slice and bake with a semi homemade twist that makes them just right for the festive time of the year. All you have to do is slice and bake the cookies. Then melt some white chocolate chips and dip half the cookie in it. A final dip in some crunchy and sweet crushed peppermint pieces and your Christmas cookie is done. Easy Peasy and so festive! If you love the flavor of peppermint in cookies, be sure to try my Rice Krispie Peppermint Ball Cookies. They are perfect for the holidays. It's time for some sugar plum fairies after eating a few of these fun cookies. Pre-Heat oven to 350°F. In large bowl, break up the refrigerated cookie dough into small pieces. Knead in 1/4 cup all-purpose flour until well blended. Shape the dough into 36 balls about 1 inch in size. Bake for 10 to 14 minutes or until edges are golden brown. Cool for1 minute; remove from cookie sheets to cooling rack and let rest until completely cool.. In s small bowl, microwave the white chocolate chips and 1 tablespoon vegetable oil uncovered on Medium (50%) 2 to 3 minutes, stirring once halfway through microwaving, until the chocolate is melted. Stir until smooth. Dip half of each cookie into melted chocolate mixture, allowing excess to drip off; place on waxed or parchment paper-lined cookie sheets. Sprinkle each with about 1/2 teaspoon crushed candy. Let stand until set.